This was a great way to spend the late afternoon. The food was good. The service for drinks after the initial service was not good and we had to try and find our wait person. The music was great! A terrible experience! Difficult to find the boat- wasn't given the name. Also, was not told the vouchers had to be exchanged for tickets. Once we got on the boat, it took forever to place a drink order. Once we placed the order, it took forever to receive our drinks! I ordered a pot of coffee and never got a cup so I couldn't drink it. We never were able to place a food order and we were hungry. Tried to place the order when we ordered drinks but were told to wait.saw our waiter only two times however, he was quick to show up to bring our bill! Excellent value for money. Large and modern boat with lovely crew and staff. We will be back to do it again next year. We took this cruise in December. We could hardly see anything for the fog. There was no commentary and the entertainment which was mentioned consisted of taped Christmas carols which you could barely hear and a photo opportunity with St Nicholas. Loved this Cruise! Food was really good and the entertainment was fun! Loved seeing St. Nick : Great for all ages! Really enjoyed this cruise as an oasis of calm during our weekend visit with number 2 daughter, 22 to the Cologne Christmas markets. Reserved seats, enjoyable entertainment with two singers covering traditional Christmas Carols, German favourite songs, the usual suspctes Winter Wonderland etc and a very welcoming St Nicholas who got local talent up to sing along as well. Plenty of food options although we stuck to gluhwein and coffee. The staff on the boat were efficient and handled serving expeditely. 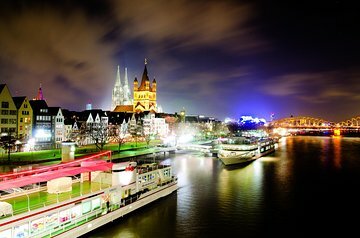 The river cruise scenery was concentrated near the end of the cruise and highlighted some of Cologne's city buildings at night. The first part of the cruise was less memorable for scenery but was counterbalanced by the on board entertainment and snack serving. I would say it is worth doing for the price paid. The actual boat trip and the Christmas entertainment were great however.....the package included a hot drink and waffles. We were told once on board we were not entitled to it and had to buy drinks, even though we questioned it, they were adamant our tickets didn't include the beverages. It spoilt the occasion and was a bit embarrassing but Viator are looking into it for me so fingers crossed it can be resolved!! The cruise was nice but the description implied that drinks and waffles were included which they were not. Everything had to be paid for as extra which was unexpected expense. Nice way to spend a couple of hours seeing the City from a different view. The boat is fantastic and the staff are extremely friendly and helpful. Food and drink is not expensive and a good variety available. Overall a great afternoon and would recommend it.